Locally grown food is more than just a stylish trend. There are countless reasons to eat locally that made it a good idea long before it was popular and will continue to uphold it as one of the foundations of a sustainable future. The benefits of local food are many, but they come in three main areas - health, economy, and environment. As Professor Emeritus John Ikerd of the University of Missouri explains, there are nutritional benefits of eating food that is straight from the field. Much of the produce filling the grocery store aisles was grown thousands of miles away, often in other countries. The quality and quantity of vitamins and minerals diminishes the longer that fruits and vegetables have to travel from farm to plate. Flavor is also lost along the way and modern agricultural breeding has focused on improving shelf life and appearance of produce more than taste and nutrition. Local growers, on the other hand, often sell at farmer's markets -- where the produce is often picked 24 hours or less before it is sold -- and they are more likely to use 'heirloom' varieties that are known for their phenomenal taste. Local farmers are also more likely to use organic growing methods, because they know their customers value an all-natural approach. They rely on building fertile soil, rather than applying concentrated fertilizers, and encourage beneficial insects to keep pests under control. Local food from small farms generally needs fewer chemicals, in part because it doesn't have to travel so far. Much of the chemicals sprayed on produce is actually post-harvest, intended to keep it from rotting on the long trip from the field to the grocery store shelf. Farmers that sell locally usually run a small scale operation where the public is invited to visit and see what they do -- most eaters would be mortified to see the chemical treatments given to the food they eat and this is not the image that local farmers want to promote. These farms are typically run by families, not corporations, and the transparency in their farming practices is a key to their success, along with cultivating a sense of community around the healthy food they produce. Pick-your-own, Halloween hay rides, cooking classes and other activities are often offered as a way to get people more involved with where their food comes from. It's satisfying to spend part of your grocery budget on locally-grown produce, as a way to put your money behind your values. In doing so, you are making it possible for local farmers to be good stewards of the Earth, while supporting their own families in the process. Profit margins are very thin in the world of agriculture, which is why most farmers attempt to scale up and participate in the global food production and distribution system, rather than stay in the local food system. 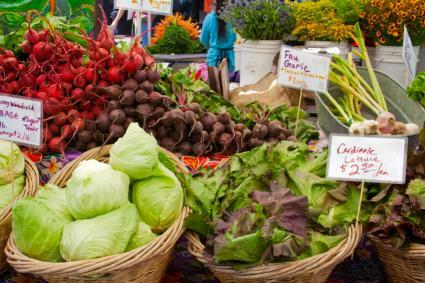 Local, organically-grown food often costs more for exactly this reason - these farmers would be unable to survive financially if they matched the prices of conventional produce. Purchasing food that comes through the distribution networks of the large agricultural conglomerates of the world takes money out of the local economy and puts it into the global economy, largely in the hands of the corporate elite. By purchasing locally-grown food, your dollars will continue to circulate within the community in a network of businesses that share similar values. Starting with the companies that supply farmers with seed all the way to the restaurants and natural grocers that feature their produce - and to you, the end consumer - the local food system is an economic network reliant on community support to grow and thrive. The closer a farm is to the place where its produce is purchased and consumed, the less fuel is used to transport it, reducing the amount of carbon emissions that enter the Earth's atmosphere. Thus, many people opt for local conventionally-grown food rather than organically-produced food from far away, believing that there is more harm to the environment caused in transporting it than in producing it. The definition of 'local' is obviously subjective, but a 100-mile radius is the typical standard. Just as food produced in the context in the global distribution system is more likely to be fumigated to resist decomposition and bred for shelf life rather than flavor, it is also more likely to come in a lot of packaging. Cellophane wrappers, Styrofoam containers and plastic packaging of all sorts are necessary to transport food over long distances and typically end up in the landfill. When buying food at a local farmstand, it's often possible to just stick it in your own reusable shopping bag and return home with no packaging materials whatsoever. Local farmers are also in the habit of recycling things like strawberry baskets and vegetable crates and are happy if you return these to them. Not all local farmers use a natural, organic approach to growing their crops, but it is increasingly common and it helps to create a healthy environment for all living creatures -- including humans. Organic farmers focus on building healthy topsoil which sequesters carbon, taking it out of the atmosphere and helping to combat global warming. The chemical fertilizers used in conventional farming systems have a deleterious effect on waterways, causing algal blooms and altering the delicately balanced water chemistry that has developed over eons and allows a diverse population of aquatic organisms to thrive. Pesticide run-off into waterways is also a serious environmental threat and the beneficial insects killed by the spray causes greater reliance on their use, as the natural system of checks and balances is destroyed. One of the reasons people choose to purchase locally-grown produce is because it simply feels good. There is an intangible quality to eating what is in season and knowing that it comes from the unique landscape of the region where you live. It creates a sense of connection to the natural systems that produce the food we eat, as well as the community of caring individuals that brings it from the fields to your plate.